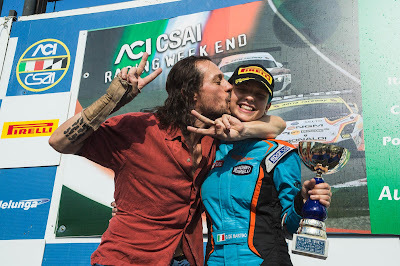 Italian Cinema Today: Interview: Cinematographer Michele D'Attanasio on "Veloce come il vento"
Based on a true story, Veloce come il vento is set in Imola, located in the region of Bologna, home of the epic race car track where infamous competitions were held, including the Formula One and Italian Grand Prix. The film portrays the conflicts of one family whose history in the business of racing is long standing and complex. Giulia De Martino, played by Matilda De Angelis, is a 17-year-old responsible for taking care of her family since her mother up and left. A novice racecar driver, she is struggling with carrying on the family name of racing champions while trying to make ends meet at home. In order to raise the money to save the family’s house, she must win a very important race. So she enlists her brother’s help. Once a champion himself, he has succumbed to a life of drug addiction. However, his vast knowledge of cars and what it takes to win are just what his little sister needs to be victorious. Without having seen the movie yet, the previews reveal a strikingly transformed Accorsi, both physically and emotionally, into this desperate, but sincere lost soul. Many scenes were shot around the city of Matera, located in the region of Basilicata. I spoke with the cinematographer, Michele D'Attanasio about his work on the film and the challenges he faces in staging the high-speed races in the winding ancient roads of Lucania. D’Attanasio has worked on a number of recent Italian blockbusters, including Gabriele Mainetti’s Lo chiamavano Jeeg Robot and Edoardo Winspeare’s In grazia di Dio. Our interview was done in Italian, so both versions are included. What is the photography process from the beginning to the end of a movie? It always starts from a script. I read it and discuss it with the production team. We talk about creating certain atmospheres and how feasible it figuring out the best ways to shoot the film. Meanwhile, I begin to contact my staff and we put together a list of technical material. After we start the actual shooting, there is little time to think. Once we completed the editing of the film, the next step was color correction where we gauged the light and colors of each shot. Qual è il processo della fotografia dall'inizio alla fine di un film? Si parte sempre da una sceneggiatura. Io la leggo e ne parlo con il regista e la produzione. Si parla di atmosfere, riferimenti cinematografici e non, fattibilità realizzative. Poi inizio i sopralluoghi e nel frattempo capisco quali sono i mezzi più adatti per girare il film. Nel frattempo inizio a contattare i miei collaboratori e stilo una lista di materiale tecnico. Dopo iniziano le riprese vere e proprie e lì c’è sempre poco tempo per pensare. Una volta che è il film è stato finito di montare passo alla color correction, dove calibro la luce e i colori di ogni inquadratura. Tell me about your work on Veloce come il vento. It was a challenge. It’s a classic movie with a good story that raises some big questions. Raccontami il tuo lavoro su Veloce come il vento. Il film “Veloce come il Vento” è stata una bella sfida. Un film con una bella storia, se vuoi per certi aspetti classica, ma con un grande interrogativo. How did you film the sequences with the race cars? Consider that the film takes place on four racetracks (Monza, Mugello, Imola, Vallelunga) as well as on a clandestine track, located on a back road between Matera and the surrounding countryside. Then, add a chase in the historic center, another in Imola and a final chase between a scooter and a moped that ends in an accident. There was an unnecessary concern that the film could be too much like an American blockbuster film such as The Fast and the Furious but we did not have the means, the budget or the interest to make that type of film. We therefore decided to approach everything in a more analogical way. The countless cameras that we used during the races were really there, attached to the cars at whizzing speed. Shooting the film was not easy. Above all, racetracks themselves are not great, especially because they do not have a large contour. Let me explain: if the Autodrome Monza can be spectacular when there is the Formula One or Gran Turismo race taking place but filming it for a movie is not the same thing. Formula one races are spectacular when being shown on television but there are disadvantages when trying to imitate them. Come realizzare le sequenze con le macchine da corsa? Considera pure che il film si svolge in 4 circuiti automobilistici (Monza, Mugello, Imola, Vallelunga) oltre che una gara clandestina girata off road tra Matera e campagne limitrofe. Al tutto aggiungi un inseguimento tra una macchina e degli harleisti per il centro storico di Imola e un inseguimento tra uno scooter ed un motorino con incidente finale. La paura era di scimmiottare in modo patetico i kolossal americani (tipo fast and furious): non avevamo ne i mezzi ne il budget e nemmeno ci interessava più tanto. Abbiamo deciso quindi di approcciare tutto in modo più analogico. Le innumerevoli macchine da prese che abbiamo usato durante le gare erano veramente lì, ancorate alle automobili che sfrecciavano a velocità pazzesche. L’uso del green back è stato ridotto al minimo, anzi forse ad un po’ meno del minimo! Realizzare la fotografia del film non era per niente facile. Soprattutto gli autodromi di per se non sono bellissimi, specie perché non hanno un grande contorno. Mi spiego meglio: se l’autodromo di Monza può essere spettacolare quando c’è la formula uno vederlo durante le gare di gran turismo ( quelle raccontate da noi nel film) non è la stessa cosa. Anche le riprese della televisione durante le gare di formula uno sono spettacolari ed anche in quel caso partivamo svantaggiati se volevamo provare ad imitarle. I saw that many scenes were shot in the region of Basilicata. Where exactly did you shoot? After spending so much time on the racetrack circuits, it was very beautiful to be shooting in Basilicata. The director and I lost ourselves in the inspirational places that we found. We discovered these places in which we shot scenes and we gave them nicknames such as lunar and western. Specifically, we shot in a private airport in Pisticci, on a backroad leading to Pisticci Scalo a Pomarico, an overpass behind Craco and in the suburbs of Matera rather than the city's historic center. Ho una serie, Basilicata: Terra di Cinema. Ho visto il film è stato girato in Basilicata. Esattamente in quali luoghi (città) hai lavorato? Raccontami la tua esperienza di ripresa in Basilicata. In your experience, what are the qualities that make the region an ideal place for shooting a film? The fact that it’s wild and free of contamination. Secondo la tua esperienza, quali qualità fanno della regione un luogo ideale per girare un film? Veloce come il vento premiered earlier in the week at the Bari International Film Festival. It will be distributed in Italian theaters today by 01 Distribution. Check back here for information on international distribution.